Only a few articles in this volume are currently online, each with permission of author. Volume posted with permission of editor and publisher. Contents page needs updated formatting! 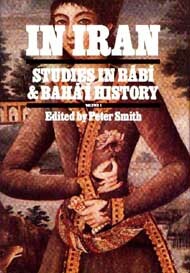 Studies in Bábí and Bahá'í history. Contents: [v. 1.] [no title] — v. 2. From Iran east and west / edited by Juan R. Cole and Moojan Momen — v. 3. In Iran / edited by Peter Smith. We all live at the end of the past. History always ends just a second ago. We live in the midst of historical change, even if we only experience it in the autobiographical terms of growing older. As human beings, it is natural for us to attempt to understand the past and the processes of change to which we are subject. The need to understand takes different forms, however. Normally, and quite naturally, we all wish to see the past in terms that are subjectively important and meaningful to us. We see the past in terms of our experience of the present. We interpret historical actions in terms of archetypes of good and evil. We imbue the events of the past with mythical and legendary importance. All this is normal. What is strange is the approach of the academic historian. The historian attempts, deliberately and systematically, to demythologize the past, and attempts the impossible task of trying to understand historical events and actions in terms of the logics and contexts of the historical actors, rather than our own. He or she questions normally accepted patterns of meaning and throws popular interpretations of historical events and actions into doubt. meaning or belief. In this event, there are, historically, two courses of action open to believers. They may reject the historian's demythologization out of hand, either denouncing or ignoring it. Alternatively, they may questioningly accept it and reflectively allow it to modify their own faith. Certainly, they should not forget that historians are inherently fallible interpreters of events. No competent historian claims to provide definitive and completely comprehensive accounts of the past. Again, believers need not fear that the historian's questioning of commonly accepted accounts of the past of itself need be destructive to faith. Religious faith may often be closely linked to accounts of the past, but it surely transcends them. Only if faith is rigid and unchanging does the historical enterprise pose a threat. In writing about the history of the Bábí and Bahá'í religions, we are conscious of writing for two audiences: fellow academics and Bahá'ís. Doubtless, most of the initial readership of this book will be Bahá'ís. To them, we must assert — unambiguously — that the standards by which this book should be judged are those of modern academic historiography. As I have suggested in my opening remarks, there is a disjunction between everyday religious understandings of the past and the work of historical scholarship. This disjunction is only a problem to the individual believer if he or she lets it be so. Let me also state that, whilst most of the contributors to this book are Bahá'ís, we are most certainly not presenting a "Bahá'í view" of Bábí and Bahá'í history. What is portrayed here is a series of separate views by the individual contributors. We are not advocating a collective position. Each essay is a contribution to the ongoing debates that surround our understanding of Bábí and Bahá'í history. the values which we hold will doubtless inform our work. Few historians imagine that history is "value-free." Believing Bahá'ís, just as believing democrats and believing Marxists, are unlikely to be able to set aside their values in their research, even if they should wish to do so. The holding of particular values, of course, should not determine the conclusions of research. Historians seek to evaluate evidence and deduce probabilities. Values enter in as part of the process of deduction — in regard to the assessment of human motivation, for example. But an honest regard for sources militates against the doctrinaire application of any belief system, be it that of liberalism, Marxism, or the Bahá'í Faith. Again, outside of the most rigid examples of totalitarian thinking, the values of a particular belief system are never unambiguous or univocal. Individuals will subscribe to a common belief system in different ways. There is no single Bahá'í method or approach to history, any more than there is a single Catholic or Mormon method or approach. Shared values may lead to a certain unity of interests and even of purpose, but they do not imply any historiographic uniformity. the development of nineteenth-century Iranian Shiism. This is unfortunate. If the Bábís are treated as being in some way separate from the mainstream of Iranian history, this seriously impedes our understanding of important aspects of its processes of change. Similarly, it is only when we recognize the essentially Shi'i concerns of the vast majority of the Bábís that their movement begins to make sense. It is not just the Bábí movement that has been neglected. Despite extensive persecution, the Bahá'í community remains the largest non-Muslim minority in Iran. It represents a significant element in Iranian society. Undoubtedly, it has played a major role in the complex process of Iranian "modernization." Yet, in terms of Iranian studies, the Bahá'ís have received little serious attention. It is hardly sufficient to continue to rely on the works of such turn-of-the-century scholars as E.G. Browne. We trust that these essays will make a useful contribution not only to the development of Bábí and Bahá'í studies, but to the integration of such studies into the mainstream of work on Iranian religious history. The Bahá'í religion itself, of course, is no longer a predominantly Iranian phenomenon. Since the 1890s, it has experienced a gradual diffusion throughout the world. Today, out of a world-wide population of around four million Bahá'ís, only three hundred thousand or so reside in Iran. Even allowing for the extensive Iranian Bahá'í diaspora, it is unlikely that Iranians account for more than one in ten of the world's Bahá'ís. For the majority, Iran may be a sacred land infused with religious significance, the original social and religious context of their Faith, but culturally and intellectually they are strangers in that land. I would like to acknowledge my gratitude to Kalimát Press, and particularly to Anthony A. Lee, for the hard labors which made the production of this book possible.